It took over three years, at the turn of the 20th Century, to formulate the Sennelier range of Extra Soft Pastels “à l’écu” and thus to create one of the largest chromatic range of pastels. Throughout the century, this range of tones has evolved, but the heart of its making remains unchanged. A Sennelier extra soft pastel is composed of high quality pure pigment grounded with a natural transparent binder. The high quality composition of “à l’écu” pastels is the result of a perfect balance between binder and pigment. For gradient shades, increasing amounts of mineral fines are added, ultimately tending towards white. The exceptional brightness is the result of the pigment and of the natural mineral fines discovered by Sennelier in 1905 and that have been used ever since. The manufacturing process of the Sennelier cylindrical pastel does not compress the paste and the pastel dries naturally in open air. The life span of a piece of work is guaranteed by the quality of the pastel, but also by the quality of the substrate. If a lot of overlapping is performed, it is preferable to fix between layers. Avoid, however, fixing the final layer too heavily, as the original vibration of tones will be lost. 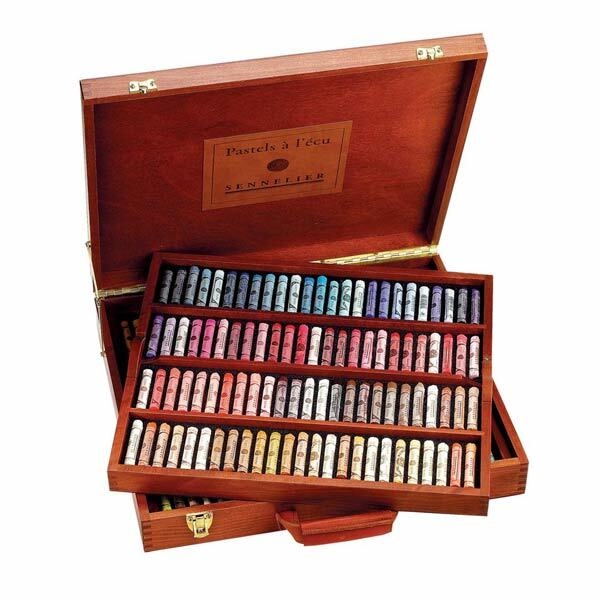 The Traditional Selection wooden box set contains a selection of 175 Sennelier pastel shades arranged in two removable wooden trays. The wooden box is sturdy with a leather carry ahndle for easy transportation. Orders for this item will take up to 7 days to fulfill.